Vines first appeared on what is now known as the Mouton-Rothschild estate in the early 18th century. Throughout the 18th century and first half of the 19th the quality of the wines increased steadily, often equalling those of the other top wines of Bordeaux, save for a short period of decline in the 1840s. This temporary fall from grace was to cost Mouton its likely status as a First Growth wine when the 1855 Classification was published, since the rankings were decided upon by the prices the wines had been fetching in the market place. The Rothschild family had bought the property in 1853, and its reputation was rapidly restored. 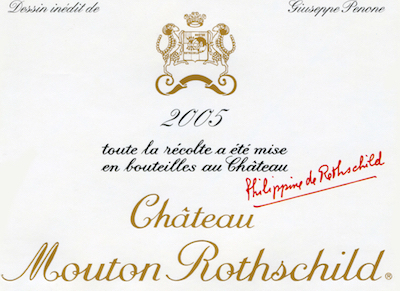 The driving force, however, proved to be a later arrival, Baron Philippe de Rothschild, who assumed control in 1922. He was a dynamic figure who revolutionised much of the running of the estate. He was the first to introduce château-bottling, as early as 1924, and instigated the practice, after the Second World War, of employing a different artist each year to design the label. His greatest achievement was to have Mouton upgraded to 1st Growth Status in 1973, the only change ever to be made to the 1855 Classification. For decades the price of Mouton had matched, and frequently surpassed, that of the other First Growths, so the logic for the promotion was undeniable. Picasso was engaged to design that vintage’s label. Philippe died in 1988 and the estate passed into the hands of his daughter, Philippine. The vineyard, comprising 75 hectares of mainly gravel-based soils, is planted to 80% Cabernet Sauvignon, 10% Cabernet Franc, 8% Merlot and 2% Petit Verdot. Grapes are hand-picked, and the juice is fermented in barrel, not in vat. After fermentation the wine is aged in new oak for 22 months before bottling. Total production is 25-30,000 cases, split between Mouton itself and the second wine, Le Petit Mouton, established in 1993. Critics who found the wines of the 1990s to be less than profound point to too high a percentage of the crop being used in the Grand Vin, compared to the other First Growths. However, in recent years, the Estate Director, Hervé Berland, has presided over a gradual tightening up of all the viticultural and wine-making practices, with the result that Mouton is once again restored to a position alongside the very best wines of Bordeaux. In style the wines have immense appeal, with exotic, powerful aromas of cassis, minerals, tobacco leaf and graphite, backed by an opulence on the palate and impressive length on the finish. “Flamboyant” is a word sometimes used in tasting notes, and in comparative blind tastings this attribute is frequently what sets Mouton apart. What is sure is that Mouton has often produced the “wine of the vintage”, and under Hervé Berlaud’s direction the property looks sure to consolidate its status as one of the world’s greatest.